. Your cart will total 898 points that will be converted into a voucher of $898 towards your next purchase! Must be logged in to collect points. 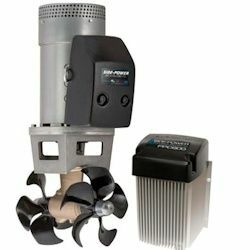 Side-Power’s new range of proportional speed control DC thrusters allow you to select the power you need for precise boat movements in any weather and sea conditions. The unique “hold” feature allows you to keep the boat in position at dock or in locks. The unique “hold” feature allows you to keep the boat in position at dock or in locks. Bow Thruster: external bow thruster, bow thruster installation, bow thruster cost, vetus bow thruster, wesmar bow thruster, hydraulic bow thruster, lewmar bow thruster, yacht thruster price, yacht thruster cost, exturn bow thruster, yacht thruster 400d, yacht thruster for sale, yacht controller, bow thruster, installing a bow thruster, boat bow thruster price, boat bow thruster installation, marine bow thruster, electric bow thruster, stern thruster, bow thruster ships, azimuth bow thruster, small boat, thruster kit, bow thruster, stern thruster, hydraulic thruster, boat control system, boat bow thruster, sideshift bow thruster review, stern thrusters prices, marine thruster, stern thruster, bow thruster ships, electric bow thruster, azimuth bow thruster, bow thruster yacht, lewmar, bow thruster installation, bow thrusters for small boats, bow thrusters for sailboats, bow thrusters for, small boats, vetus bow thrusters, stern thrusters, lewmar bow thrusters, bow thrusters prices, side power bow thrusters, side power, sidepower, side-power, thruster, thrusters, imtra, side-power thruster, marine bow thruster, marine thrusters, thrusters units, tunnels installation kit, bow thruster 12v, bow thruster 24v.